Situated on the Mediterranean coast of the Peloponnese peninsula, surrounded by beautiful rock formations, the small town of Leonidio is a perfect destination for climbing in Greece. There are many reasons to consider Leonidio as 'the new Kalymnos' but the local climbing cooperative, who have published this guidebook, present the area with its own history and unique qualities. 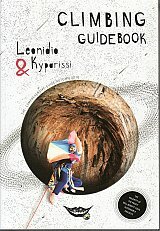 There are more than 40 introduction pages describing the area, climate, wildlife, how to get there, accommodation, suggestions for rest days, access to crags and the history of climbing around Leonidio. The photo-topos cover over 950 bolted climbing routes across more than 50 sectors. All text is in English.